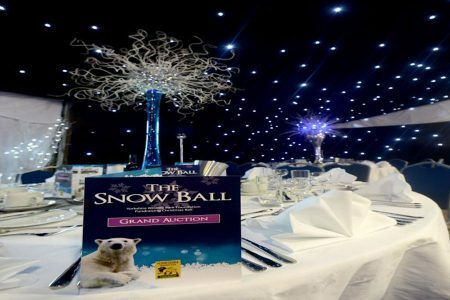 The Yorkshire Wildlife Park Foundation is appealing to local businesses for help to raise tens of thousands of pounds for animal conservation by supporting its second Snow Ball. The charity is looking for a headline sponsor as well as unique lots for the auction on the glittering fundraising night. The inaugural Snow Ball was a huge success and raised £20,000 at the award winning park, which is a major force in the protection of endangered species around the world. Guests enjoyed a champagne reception and four course dinner in the Tsavo Lodge accompanied by live music and followed by an auction. The headline sponsor package is £5,500. There are also opportunities to sponsor one of the four courses (£1,500 each) or donate prizes for the grand auction. Last year’s lots included a first ever Polar Bear Experience at YWP, break on a super yacht in Porto Montenegro, a mini break at Victoria Falls with a safari River Chobe cruise, a Doncaster Racecourse private box for 20 and accommodation at the Crown Hotel, Bawtry, a flight over YWP in a private plane, tour of the Emmerdale set as well as two Wembley Football Final tickets and other prizes. This year the spectacular pre-Christmas evening will be on November 14 – tickets will be on sale from 30th September. Yorkshire Wildlife Park in Branton is home to the Yorkshire Wildlife Park Foundation which was set up in 2013 to fund animal welfare and conservation supporting species such as Amur Leopards and Tigers, Polar Bears, as well as the most endangered carnivores in Africa, the Painted Hunting Dog. It has also supported welfare projects in Vietnam. The aim is also to advance the education of the public in relation to the conservation and welfare of exotic and endangered wildlife both in the wild and in captivity. The Snow Ball will round off a series of successful fundraising days during 2015, including Animal Action Day and this Sunday, 27th September International Tiger and Leopard Day.